If Lelouch is still alive after the Zero Requiem (which he probably is because of the appearance of the third season), he probably goes into hiding. Do people know that C.C. was an accomplice of Lelouch, or is she treated like Lloyd (basically acquired after Lelouch's regime)? I might've missed something in the anime, but basically, would C.C. need to go into hiding with Lelouch, or can she live as she used to without being sought out? Actually, C.C. was only known by the main heads of the Black Knights organization, by V.V. 's organization and by the member of the royal family linked to the Geass. On one hand, the closest person to Zero all knew he was Lelouch Vi Britannia since Schneizel told them. Based on what they knew about Zero, Lelouch and Suzaku and based on Karen's reaction when Lelouch gets killed, I believe everyone that knows C.C. on the Black Knights organization knows Lelouch was not evil. On the other hand, the Geass organization has been slaughtered by Lelouch and V.V. 's is gone for good. I can assume no one is going to annoy her because, well, they are all dead. Same goes for Lelouch's mother and father. Conclusion: Since only ancient members of Black Knights organisation know C.C. exists and we are sure that they have no reason to be after her, C.C. is probably wandering and travelling across the world (or maybe just Japan) with Lelouch if he is alive, alone if he is not, without anyone to disturb her. We know now that there won't be a third season, the announced new project is a movie which is part of the alternate universe which was created by the trilogy which were released during the past year. As for Lelouch being alive in that movie, yes that is true. However, we mustn't forget the context of this. Lelouch was officially confirmed dead by the show staff, and that's why the name of the sequel is "Lelouch of the Resurrection", because he will be resurrected from the grave. In the original series, she's alive and mourning Lelouch's death, but she comforts herself knowing that Lelouch has died to achieve his goals, the Zero Requiem. This can be seen in the remade epilogue from 2009. In the new and alternate universe, she's alive and mourning Lelouch's death, BUT it seems she is not willing to accept his fate and will resurrect him. How exactly she will do that will be known once the movie is released in Japanese theaters in February 2019. In case you're wondering about Lelouch being dead, this has been officially confirmed many times by the show creators, but not many English speaking fans seem to know that because these interviews, the official guidebook, the live commentaries, etc were all in Japanese. 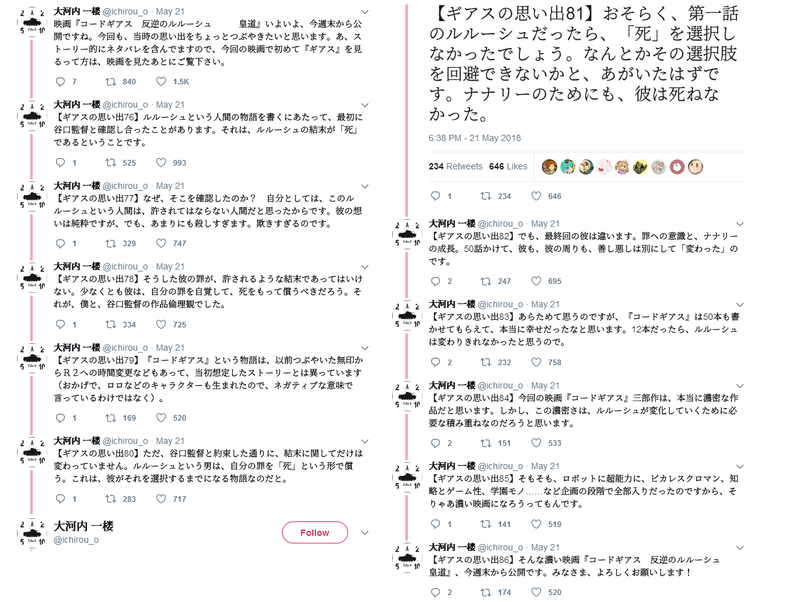 There's a post on Reddit which has gathered all the official statements and translated them, all with links, sources, and pictures. 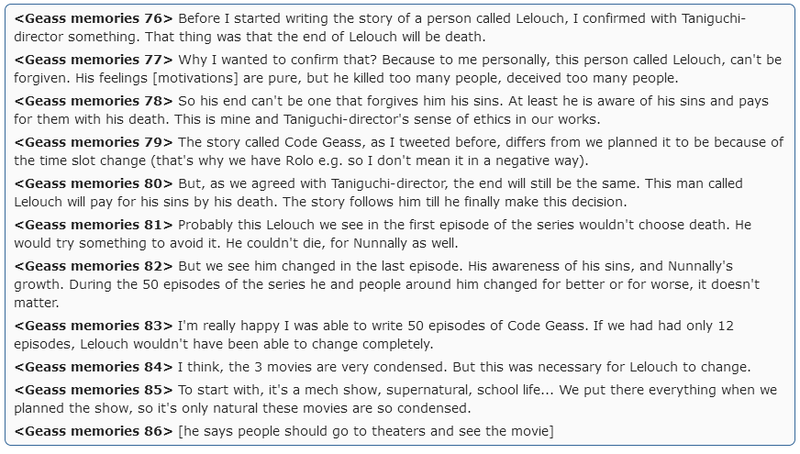 That post also shows that the anime itself contradicts code theory, it's impossible for Lelouch to have the code. Going into detail here is too far removed from your question, if you're interested you can read the Reddit post. I will, however, give 1 example of the official statements where they confirm Lelouch to be dead: the tweets by the show staff. "Before I started writing the story of a person called Lelouch, I confirmed with Taniguchi-director something. That thing was that the end of Lelouch will be death." "At least he is aware of his sins and pays for them with his death." "This man called Lelouch will pay for his sins by his death. The story follows him till he finally make this decision." "Probably this Lelouch we see in the first episode of the series wouldn't choose death. He would try something to avoid it. He couldn't die, for Nunnally as well. But we see him changed in the last episode." My guess is that Lelouch might have been on the cart as well. I think so because Lelouch had got his father's code since he said he was to give Geass to all people in the world. Since only a person with Code, for example C2, could give Geass, it could mean that Lelouch had to die so he could come back immortal like C2 and give the code to everyone. In that way, the two could live happily ever after. Moreover, in the last episode, we see C2 a little bit worried for Lelouch saying, 'Lelouch, the price for what you are about to do' [referring to killing himself]. I think she was worried about Lelouch attempting to become immortal. So Lelouch lives on, though I doubt Sousuke Kurarugi know about this.